When a vessel transits Mobile Bay and does not travel south of Mobile Ship Channel Buoy # 22, the tonnage charge will not be assessed. 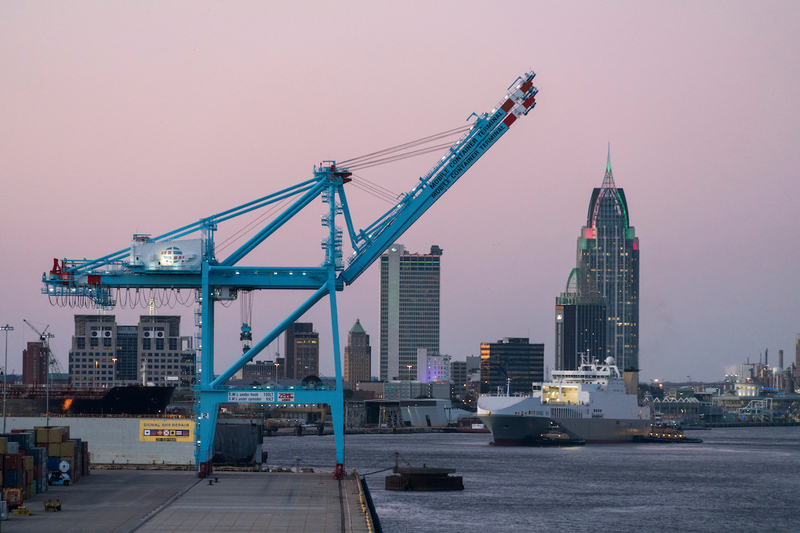 When a Bar Pilot is required to shift a vessel within the harbor of Mobile or within Theodore Harbor, the charges shall be the same as the shifting charges of the Alabama State Port Authority. When a vessel sails the harbor of Mobile or Theodore, and has to return to port for any reason, a round trip pilotage charge will be made if the vessel reaches a point south of Middle Bay Lighthouse. If the vessel turns around above this point, one way pilotage will be charged. When a pilot reports aboard a vessel at the time ordered and the vessels sailing is delayed for any reason, detention shall be charged until the pilot is dismissed or the vessel sails. Waiting time ends when the last line is let go, or if anchored, when the anchor is aweigh. If the delay is less than one hour, the fee is waived. Vessels on which the boarding time is cancelled without at least an hour and a half (1 ½) notice shall be charged a cancellation fee. 5% “Transportation/Fuel Surcharge” to be included on every vessel transit charge. 1.5% “Safety Education Surcharge” to be included on every vessel transit charge. Rigs (Drill Rigs, Lay Barges, Derrick barges, or any special purpose vessel required to be towed): Double regular pilotage rates and fees plus $500 per hour or part thereof for each pilot. Dead ship tows and deep sea tows requiring more than one pilot: Regular pilotage rates and fees plus $400 per hour or part thereof for each pilot. Deep sea tows requiring one pilot: Regular pilotage rates and fees plus $400 per hour or part thereof. Vessels whose dimensions are 950 feet in length or greater and 150 feet in beam or greater, or with deadweight of 150,000 or greater: These vessels are required to take two (2) pilots. Two (2) regular pilotage rates and fees shall be charged. Other vessels may require the services of two (2) pilots if safety warrants. Vessels whose beams exceed 115 feet docking or undocking at Atlantic Marine Shipyard: These vessels are required to take a full pilot and an assist pilot. The assist pilot charge is half (1/2) regular pilotage rates and fees. Carrying a pilot away from station: Any pilot who is carried away to another port due to heavy weather and before the Master has waited around Mobile bar for four (4) hours as prescribed by law, shall receive $800 per day for each day he is away, plus first class transportation back to Mobile, Alabama. Special services: A charge of $250 per hour or part thereof shall be made for any special services not previously addressed by tariff. This shall apply to Dynamic Positioning Vessels and rigs, and effective April 1, 2007 any vessels conducting sea trials in state waters. This charge is in addition to regular pilotage fees. Tariff amendment: Any vessel whose length is 1000 feet or greater regardless of beam shall require two (2) pilots. Two (2) regular pilotage rates and fees shall be charged. The Mobile Bar Pilots reserve the right to mandate daylight transit of any vessel whose length is 1000 feet to 1050 feet regardless of beam in the Mobile/Theodore Ship Channel(s) if the status of navigational aids or weather warrants. Any vessel whose length is over 1050 feet, regardless of beam, is subject to review of the Safety Committee and the majority of the pilots to determine if daylight transit is required.